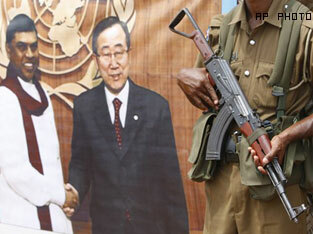 UNITED NATIONS, August 12 -- That the third in the series “Giants of Asia” by Tom Plate is slated to be UN Secretary General Ban Ki-moon was disclosed several times on August 10. But Mr. Ban's spokesman Martin Nesirky, when Inner City Press at the UN's August 11 noon briefing asked for the confirmation and rationale, said “let me find out.” Seven hours later, in person and in the UN transcript, Nesirky provided no information. 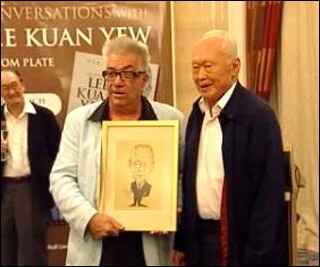 Plate's first “Giant of Asia,” Singapore's Lee Kuan Yew, reveals that the United States' first choice to replace Kofi Annan as Secretary General in 2006 was another former Singaporean prime minister, Goh Chok Tong, and that Ban traveled to Singapore specifically to make sure he stayed out of the race. “the Bush administration... began sounding out Singapore about the possible availability of Goh Chok Tong...far and away America's first choice for the position to replace Annan. 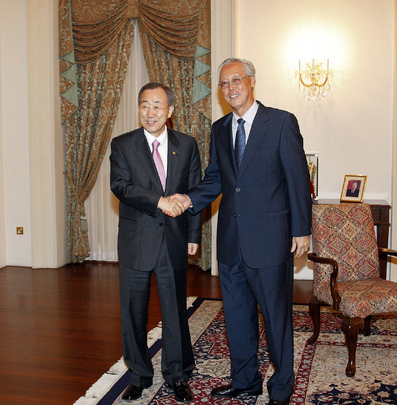 So I am in Korea and South Korean foreign minister Ban Ki-moon knew that the Americans were supporting Goh Chok Tong for the job... Ban Ki-moon invited me to a lunch, gave me a swank lunch and said, is your colleague running for it? I said, no. He said, are you sure? I said, absolutely. He said, why? I said, it is not a job that he is fitted for. Singapore's respected Permanent Representative to the UN Vanu Gopala Menon, given the attendance list at the VIP book party he hosted on August 10, diplomatically insisted that Singapore had never formally had a candidate who opposed Mr. Ban. But this account, presented as true by Tom Plate who now plans to do a similar “Giants of Asia” book with Ban Ki-moon, raises many questions. At the August 10 book party, Plate said he would profile the Dai Lama if and only if mainland China made it clear none of their leaders would participate. Thus, a major qualification for being among Plate's “Giants of Asia” is simply the willingness to spend days talking to Plate. Inner City Press: I wanted you to confirm that the Secretary-General has consented and is going forward as the subject of the third in a series called Giants of Asia, by author Tom Plate. He said that he is writing a series of great leaders of Asia. He began with Singapore’s leader, Malaysia’s, and that the third will be the Secretary-General, and I wanted to know… to confirm that is the case and how much time it will take, when it will take place and what factors he thought going into it. It seems pretty extensive; from having heard Mr. Plate speak last night it seems like it’s a very one-on-one, extremely… what’s the benefit to the UN system of such a profile? Spokesperson Nesirky: Let me find out.